Deploying a static site to Netlify is slick and easy. But if you don’t want to transfer your DNS there too, you can keep it on Cloudflare, which does DNS and a whole bunch more. 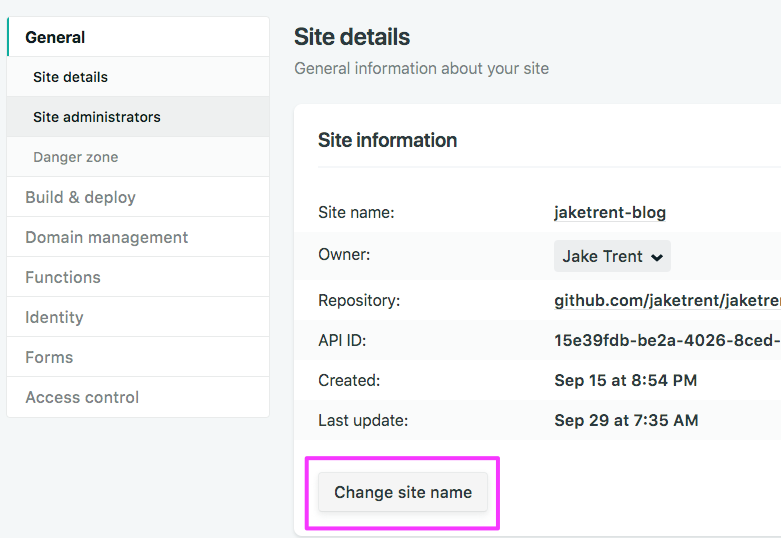 Once you deploy to Netlify, you’ll want to edit your Site Name to be something short, memorable, and descriptive. For this blog, I chose jaketrent-blog.netlify.com. Once that’s set, we’re ready to rock and roll with some DNS. Also note that we’ve clicked the orange cloud, deactivating the Cloudflare HTTP proxy. It is now grayed out to show that we’re only using Cloudflare for DNS and not as a CDN. Netlify will provide all the CDN support for this domain that we need. 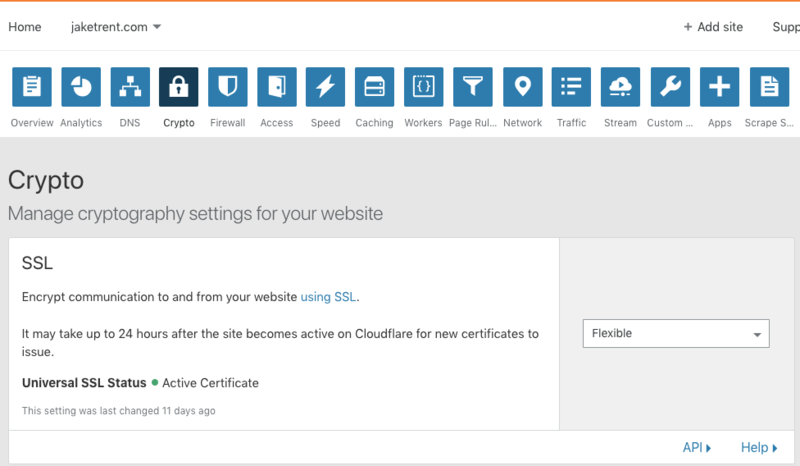 Now your DNS record is setup on Cloudflare, and you need to make your Netlify site compatible with it. The key is the add a “Custom Domain” on the netlify side. This does not mean that you are purchasing a domain or even setting up DNS on Netlify (though you can if you’d rather). It simply means that we’re going to tell netlify to look respond to that DNS record (setup elsewhere on Cloudflare) when the site is requested that way. When I setup my custom domain, I simply set it as jaketrent.com. DNS does require some time to propagate (up to 24 hrs), but in my case I got lucky and this started working immediately. And that should be enough. As in, enough opsy configs for one day!